Most of the Website has the sending of email feature like send single email or bulk email. So In this post we have discuss topic like how can we send bulk email by using PHP script with PHPMailer Ajax and Jquery. We have use PHPMailer Library because PHP mail() function will not work on localhost. So we have discuss how can we send single or bulk email from localhost in PHP with PHPMailer by using Ajax Jquery. So we can send single or bulk email without refresh or webpage. We have use SMTP for send bulk mail because SMTP us the most suggested way to send email from localhost or online server. If we have use SMTP to send mail so PHP has nice library PHPMailer library which allow to send email via SMTP by providing required credential. If you have any web hosting email account then your hosting company will provide SMTP credential like username, password, outgoing and incoming server address and port number. By using this information you can configured this details into PHPMailer class and then after you can send email from your script. In this post we have make simple application from which we can send bulk email to customer by single click. Here we have use Jquery with Ajax so we can send email without refresh of web page. When we have click on button then it will collect email from checkboxes data attribute by using Jquery and after collecting data it will send this data to Ajax request and via Ajax request it will transfer to PHP script and in this we have use PHPMailer class with required SMTP configuration and it will send bulk email and after sending all email successfully it will send data to Ajax request and it will display on web page. 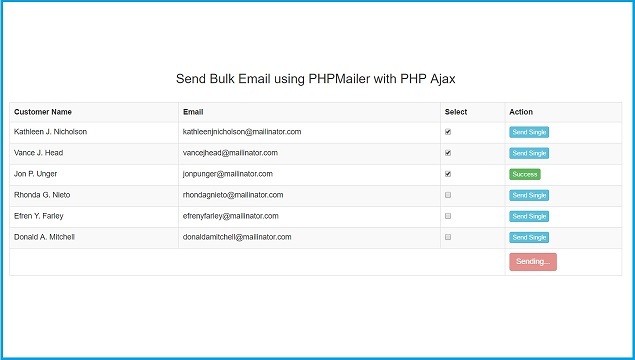 This way we can use Ajax with Jquery for Send bulk email by using PHP with PHPMailer Library. Try it in server, localhost wont work.